The Legal Genealogist knows better. Even if I don’t show it as often as I should. I mean, you’d think after as many blog posts as I’ve written saying I should have seen that question coming that I’d be better at seeing the question coming. And I suspected yesterday that somebody was going to take one look at that table of National Archives repositories for the records of the Circuit Courts and ask the question that pinged into the email about a nanosecond after the blog post was published. What districts — what states and what territories — are in what circuits? 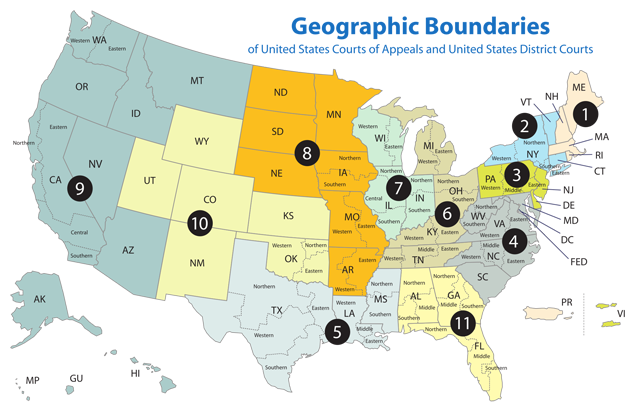 And see the cool interactive map at the Federal Judicial Center website where you can mouse over a circuit and see the individual district courts within that circuit. So… what about the circuits historically? Where are those records now? From the 1789 Judiciary Act until 1891, there were three levels of federal courts: the District Courts, which were low-level trial courts with fairly limited jurisdiction; the Circuit Courts, which were both appellate courts (hearing appeals from the District Courts) and trial courts, handling all the cases that couldn’t be tried by the District Courts; and the Supreme Court. So the records of the Circuit Courts from 1789 until 1911 are considered trial court records, and they’re in Record Group 21, Records of the United States District Courts. You’ll find them in the specific National Archives branch that has the records for the District Courts in that state. The records of the United States Courts of Appeals for the various circuits — in Record Group 276, Records of the United States Courts of Appeals — include appeals from the specific districts that make up that circuit. • Boston, U.S. Court of Appeals for the First Circuit, Maine, Massachusetts, New Hampshire, Rhode Island and Puerto Rico. • New York, U.S. Court of Appeals for the Second Circuit, Connecticut, New York, and Vermont. • Philadelphia, U.S. Court of Appeals for the Third Circuit, Delaware, New Jersey, Pennsylvania, and Virgin Islands. • Philadelphia, U.S. Court of Appeals for the Fourth Circuit, Maryland, North Carolina, South Carolina, Virginia, and West Virginia. • Fort Worth, U.S. Court of Appeals for the Fifth Circuit, Alabama, Florida, Georgia, Louisiana, Mississippi, and Texas. • Chicago, U.S. Court of Appeals for the Sixth Circuit, Kentucky, Michigan, Ohio, and Tennessee. • Chicago, U.S. Court of Appeals for the Seventh Circuit, Illinois, Indiana, and Wisconsin. • Kansas City, U.S. Court of Appeals for the Eighth Circuit, Arkansas, Iowa, Minnesota, Missouri, Nebraska, North Dakota, and South Dakota. • San Francisco, U.S. Court of Appeals for the Ninth Circuit, Alaska, Arizona, California, Hawaii, Idaho, Montana, Nevada, Oregon, Washington, Guam, and Northern Mariana Islands. • Denver, U.S. Court of Appeals for the Tenth Circuit, Colorado, Kansas, New Mexico, Oklahoma, Utah, and Wyoming, starting in 1929. For 1911-1929, see Eighth Circuit. • Atlanta, U.S. Court of Appeals for the Eleventh Circuit, Alabama, Florida, Georgia, starting in 1980. For earlier records, see Fifth Circuit. • Archives I, Washington, D.C., U.S. Court of Appeals for the District of Columbia, District of Columbia. Federal Judicial History is a downloadable PDF. Now I’m curious. How does American Samoa fit into all of this? It’s a territory, the same status as Guam and the Virgin Island, but isn’t in any of the lists. Of course, the question is easily answered by a web search, and the WikiPedia article on “Judiciary of American Samoa” says, “Because American Samoa does not have a federal court like the Northern Mariana Islands, Guam, or the United States Virgin Islands, matters of federal law arising in American Samoa have generally been adjudicated in the United States District Court for the District of Hawaii or the District Court for the District of Columbia.” This statement, naturally, is not attributed, but there is a link to a GAO report, “American Samoa: Issues Associated With Some Federal Court Options.” Lo and behold, the very first sentence in the report is the problematic quotation. If anyone’s interested, the link is to a PDF download of the report at http://www.gao.gov/assets/130/121189.pdf . I don’t know if it’s possible to make that a hyperlink in a comment — still working on learning the fine points of HTML!